Learn English with Ellen DeGeneres in this episode of The English Fluency Guide! Learn English with Ellen: In this episode of The English Fluency Guide, learn 5 conversational English phrases featured in a video clip from the Ellen Show! In this clip, Kate McKinnon impersonates Ellen. The 5 conversational English phrases from this lesson will help you understand some of their jokes. and it is a pleasure to welcome you to this brand new series here on YouTube. 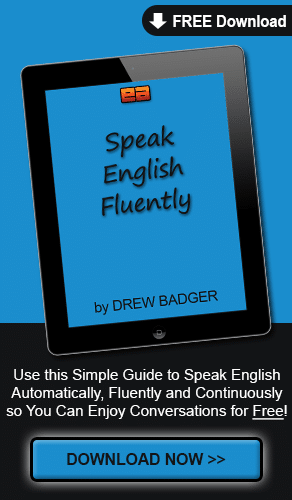 This is the English Fluency Guide. and then just explaining it to help you understand it. native content that’s already available right here on YouTube. So when you move from this channel to other channels, this will help you meet more people to practice with, so native speakers that you can comment with as well. uh, understand the native accents and develop their better pronunciation and overall fluency. and so, when I finally had this idea, I thought, okay, let’s make a video very quickly. Let’s try it out and see if other people enjoy it as much as I think you will. So, in this first video, you can see I’m here in Ellen’s studio. Yay. what I should do first for this, a bunch of people were saying, “Hey, I like watching the Ellen Show. Can you help me understand some parts of it?” something like that. 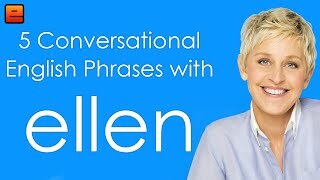 little phrases, five conversational phrases that appear in one particular clip from the Ellen Show. visiting Ellen on the Ellen Show. but maybe don’t understand everything they hear. So I wanted to cover a few phrases from it. related to this and even just from the conversation in generation right now. Now, when you’re doing someone, it means you’re impersonating them or you’re doing an impression of that person. So, when you see Kate McKinnon come on the show, she has the wig on and the clothes and other things. you’ll see her looking like Ellen and she’s doing Ellen. She’s doing an impression of Ellen. The second phrase is the old me or the new me. but that’s not really the way I look now. So that’s the old me, the old me. So, as an example, maybe I start wearing like T-shirts and jeans all the time or I’ve been wearing that, but now I start wearing a suit or a tuxedo every day. So T-shirts and jeans, that’s the old me. the new me or the old me. Our next phrase is to treasure something or to treasure something forever. and it’s especially important to you. she’s kind of making a joke. Next, you’ll see Kate McKinnon pick up a book. or ‘it comes in a tiny book’ or something like that. you’ll often hear people talking about something coming in or being available in a particular size. So maybe this white shirt I’m wearing right now also comes in black or it comes in blue or it comes in a smaller size. and usually because we don’t talk about books coming in different sizes, she was noticing something funny about that. cute size, like a cute goat, she says. Our final conversational phrase is to catch something or to catch someone on a TV show or at a particular time. At the end of the clip, you’ll see Ellen use this and it’s a little bit difficult to hear her because both she and Kate are talking at the same time. some time, whatever on Saturdays it is. I think it’s maybe nine or 10 o’clock or something like that. you can also catch a TV show. but in a more conversational way. Well, that’s it for this first video in the English Fluency Guide. and become a subscriber to the YouTube channel, if you aren’t already. And I would really like to know, number one, if you did enjoy this, comment down below. let me know what they are so you can help me decide what I’ll cover for the next video. And now it’s time to watch the actual clip, the things that you’ve just learned, in action. or in the description below this video so you can watch Kate and Ellen having this conversation. It’s actually an entertaining clip and I think you’ll enjoy it. do take our Real English Fluency Quiz. and help you see two, three or even 10 times more improvement in your English fluency and speaking confidence. Keep practicing and have a fantastic day. Enjoy the Interactive Transcript above or the Text Transcript Below! Hi there. I’m Drew Badger, the world’s number one English fluency guide and it is a pleasure to welcome you to this brand new series here on YouTube. This is the English Fluency Guide. Well, what I’ll be doing in this new series is taking the wealth of content that’s available on YouTube instead of trying to create a whole bunch of content myself and then just explaining it to help you understand it. Really, the goal of this channel is to help you move from an English learning channel to understanding and enjoying all of the natural native content that’s already available right here on YouTube. So when you move from this channel to other channels, this will help you meet more people to practice with, so native speakers that you can comment with as well. And it will also help you, uh, understand the native accents and develop their better pronunciation and overall fluency. There are a lot of great reasons to do this and so, when I finally had this idea, I thought, okay, let’s make a video very quickly. Let’s try it out and see if other people enjoy it as much as I think you will. So, in this first video, you can see I’m here in Ellen’s studio. Yay. So when I, uh, asked my, uh, people or my, uh, followers, my fans, uh, my newsletter subscribers what I should do first for this, a bunch of people were saying, “Hey, I like watching the Ellen Show. Can you help me understand some parts of it?” something like that. So what we’re going to do today is cover five little phrases, five conversational phrases that appear in one particular clip from the Ellen Show. Let’s get into it. For a bit of background, the video we’re covering today features Kate McKinnon, a comedian from the show, Saturday Night Live, visiting Ellen on the Ellen Show. Now, the Ellen Show is a popular daytime TV show and the reason I chose it again is because we have a lot of people that were interested in seeing that, a lot of people that watch the show, but maybe don’t understand everything they hear. So I wanted to cover a few phrases from it. And what you’ll see in the video is Kate McKinnon pretending to be Ellen and so we’ll talk about a couple of the phrases that are related to this and even just from the conversation in generation right now. Our first phrase is to do someone, to do someone. Now, when you’re doing someone, it means you’re impersonating them or you’re doing an impression of that person. So, when you see Kate McKinnon come on the show, she has the wig on and the clothes and other things. She doesn’t start like that at the beginning of the clip, but when she comes back on later, you’ll see her looking like Ellen and she’s doing Ellen. She’s doing an impression of Ellen. To do someone. The second phrase is the old me or the new me. Now, when Kate McKinnon comes onto the show, Ellen is saying, “I’ve seen some videos of you doing me,” so impersonating me, but that’s not really the way I look now. So that’s the old me, the old me. So, as an example, maybe I start wearing like T-shirts and jeans all the time or I’ve been wearing that, but now I start wearing a suit or a tuxedo every day. So T-shirts and jeans, that’s the old me. This is the new me with a nice suit on, the new me or the old me. Next, you’ll see Kate McKinnon pick up a book. So she’s got some copies of Ellen or Ellen has some copies of her own book on a little table in the clip and Kate McKinnon picks up a book and she also has a small copy of the book and she uses the phrase, ‘it comes in a little size’ or ‘it comes in a tiny book’ or something like that. When you’re buying something that has different sizes or different variations, you’ll often hear people talking about something coming in or being available in a particular size. So maybe this white shirt I’m wearing right now also comes in black or it comes in blue or it comes in a smaller size. So, again, Kate McKinnon is making a joke, saying that the book, and usually because we don’t talk about books coming in different sizes, she was noticing something funny about that. So we’ve got a large regular book and then the book also comes in a smaller, cute size, like a cute goat, she says. Our final conversational phrase is to catch something or to catch someone on a TV show or at a particular time. At the end of the clip, you’ll see Ellen use this and it’s a little bit difficult to hear her because both she and Kate are talking at the same time. They’re kind of talking over each other, but Ellen does say that you can catch Kate on Saturday Night Live or you can catch her on Saturday Night Live or you can catch Saturday Night Live at some time, whatever on Saturdays it is. I think it’s maybe nine or 10 o’clock or something like that. I forget exactly. But anyway, to catch something at a particular time, this is what people usually use, the conversational, natural way of expressing that you can watch something or you can see something at a particular time. So in the same way that you can catch a train and you can catch a taxi, something like that, you can also catch a TV show. So you can watch her or you can hold her, something like that, in the same kind of idea, but in a more conversational way. Well, that’s it for this first video in the English Fluency Guide. If you have enjoyed this video, do click that like button and become a subscriber to the YouTube channel, if you aren’t already. I look forward to seeing you in the next video. And I would really like to know, number one, if you did enjoy this, comment down below. Let me know what you liked about the video and, number two, if there are particular things, like TED Talks or other things, let me know what they are so you can help me decide what I’ll cover for the next video. I look forward to seeing you in the next one. Bye bye. And now it’s time to watch the actual clip, the things that you’ve just learned, in action. So I’d like you to click on the link in this video or in the description below this video so you can watch Kate and Ellen having this conversation. It’s actually an entertaining clip and I think you’ll enjoy it. And, if you have not done so already, do take our Real English Fluency Quiz. 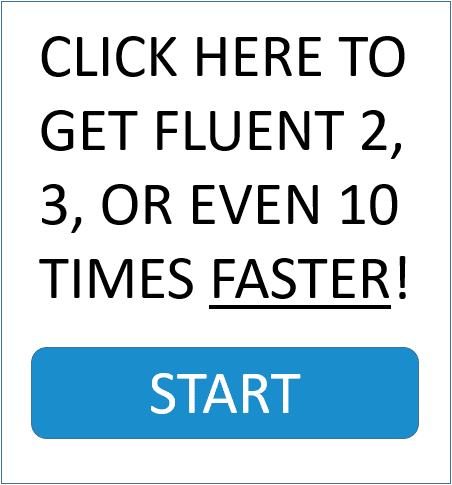 This will help you figure out exactly what your problem areas are with your fluency and help you see two, three or even 10 times more improvement in your English fluency and speaking confidence. Keep practicing and have a fantastic day.